Road Safety Products Our Company specializes in manufacturing Road Safety Products like Road Studs, Blinkers, and Cheveron. Our Road Safety Products are used throughout the world due to their unmatched quality and safe usage. We bring you this solution for lighting up driveways, pathways and roads for your home, office, hotels, farms and factories and roads. These die cast strong aluminium studs come with efficient solar panels and batteries for charging during daytime to light up automatically at night. The batteries store enough power to last 10 hours of night lighting. These solar studs can be easily installed with groundnuts for permanent fitting and by pegs for temporary fitting. 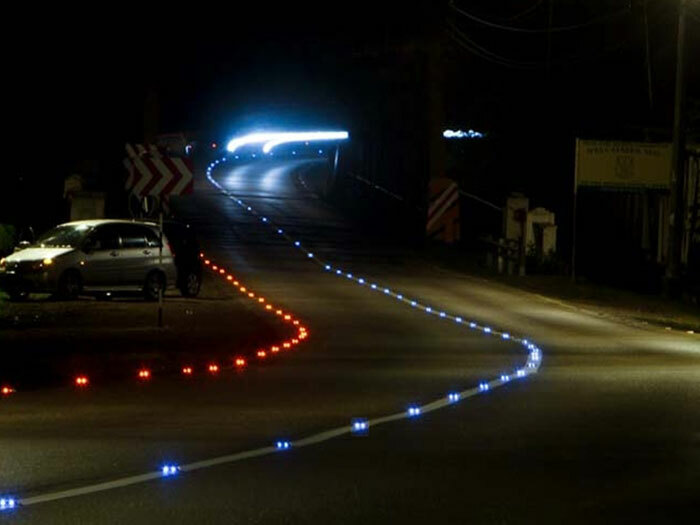 at desired places on your roads These solar LED road studs are naturally charged by the sun. As soon as it starts getting dark the LED lights in the stud come on automatically each night for up to 10 hours. They have been specifically designed for road safety in mind and can help to prevent serious accidents and emit rather than reflect light. Solar LED Road Studs are also known as solar raised pavement markers, solar reflective lane markers and solar warning devices. Place to Install: Guidance lines, traffic islands, roundabouts and mountain roads. Dangerous blind corners and sharp-curves, black spots and poorly lit areas. Taxiways at airports, bike and pedestrian lanes, aboard ships and watercraft. Areas with unpredictable weather conditions (coastal roads, foggy areas, wet and rainy regions, etc.). Joint intersections, on and off ramps, center lines and dividers, entrance warnings, carpool lanes, bridges, cross and side walks Entertainment areas, parking lots, hotel entrances and gas stations etc. They can even be seen from a distance of up to 545 yards!!! They are cost effective, easy to install and require no maintenance."